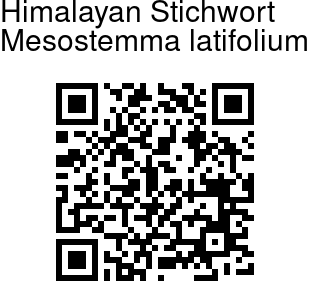 Himalayan Stichwort is a branched, procumbent herb, 7-25 cm, woolly above, hairless below. Lower leaves are shortly stalked, ovate-heart-shaped or round, mucronate at tip, 5-17 x 4-8 mm, thick-margined; upper leaves lanceshaped, smaller. Flowers are borne singly, flower-stalks arising from upper axils, slender, hairless. Sepals are 4, subulate, lanceshaped, 5-7 mm long, narrow scarious-margined. Petals are 4, divided into two with oblong blunt lobes, twice as long as sepals, white. Stamens are 8, styles 2. Capsules are ovoid, about 3 x 2 mm, hyaline; seeds nearly round, a compressed, 0.7 - 1 mm in diam., brown, smooth. 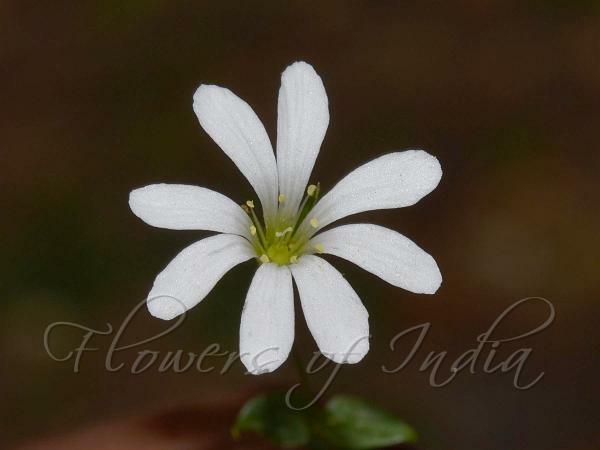 Himalayan Stichwort is found in temperate and alpine Himalayas, from Kashmir, Himachal Pradesh, Uttarakhand to Nepal, at altitudes of 2600-3400 m. Flowering: April-June. Identification credit: D.S. Rawat Photographed in Churdhar Sanctuary, Himachal Pradesh.